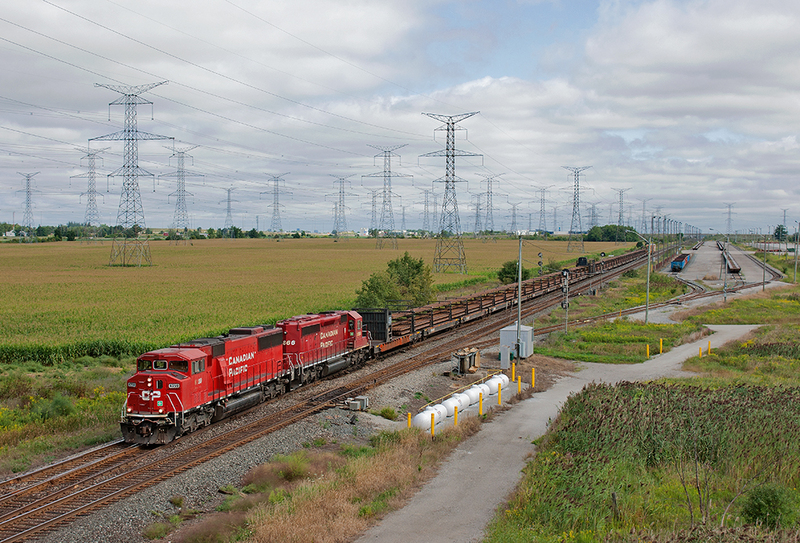 Railpictures.ca - Michael Da Costa Photo: After sitting for two days at P66 account no train crews, the ribbon rail train heads west on the Galt Sub passing the now empty Expressway yard in Hornby. The train is down to 10 mph as they take the east crossover at Hornby to the south track for the rest of the trip to Milton, where they will try and dump rail. | Railpictures.ca – Canadian Railway Photography – photographie ferroviaire Canadienne. Caption: After sitting for two days at P66 account no train crews, the ribbon rail train heads west on the Galt Sub passing the now empty Expressway yard in Hornby. The train is down to 10 mph as they take the east crossover at Hornby to the south track for the rest of the trip to Milton, where they will try and dump rail.